Emirates has launched an additional privilege to extend the usage of its luxury lounges at Dubai International Airport to its Loyalty Programme members and their guests at a minimal fee regardless of their class of travel. The pay-per-visit access will be available to Emirates Skywards members and their guests travelling on Emirates. Business Class travellers now also have the option to pay an upgrade fee to access the First Class lounges. Dubai International Airport is home to seven Emirates lounges spread over three concourses – A, B and C. In each of the concourses there is a dedicated Emirates First Class and Business Class lounge. Eligible guests can access the Emirates Business Class lounges in Dubai for a fee of US$ 100 and the Emirates First Class lounges for a fee of US$ 200. Business Class customers can also upgrade to First Class lounge access for a fee of US$ 100. Guests who have paid a fee for entry can stay for up to four hours. Currently, First and Business Class customers as well as Silver, Gold and Platinum Skywards members receive complimentary access to the lounges in Dubai. “Our premium lounges here at our hub in Dubai are some of the best in the world and we are pleased that more of our customers can now experience them. We made the decision to expand access to our lounges in Dubai based on our customer feedback, and after a careful review to ensure that the same quality experience can be maintained. We are pleased to see many of our customers appreciate the opportunity to be able to pay for their additional guests and access the lounge which enables them to enjoy a relaxing space and indulge in delicious meals before their flight,” said Adel Al Redha Emirates’ Executive Vice President and Chief Operations Officer. All our lounges have been designed with careful attention to detail, with elegant architectural features, stylish interior spaces, timber trellis work and bespoke furniture from Italy. Emirates also continually invests to upgrade and refresh its lounge experience. The Emirates Business Class lounge in Concourse B recently underwent an US$ 11 million makeover. Besides a full range of gourmet cuisine – prepared on-site by Emirates Chefs – a complimentary full bar service, shower facilities, a health spa, wine cellar and a dedicated children’s play area, the newly refurbished lounge also features three distinct concept areas: a barista experience in partnership with Costa Coffee; a Health hub with Voss water featuring healthier food and beverage options; and an exclusive first-of-its-kind Moët & Chandon champagne lounge designed for Emirates, all of which are complimentary for guests. The First Class lounges in Dubai are also a must-visit with a premium cigar lounge in Concourse A, a la carte dining and shoe shining services – all complimentary for guests once inside. 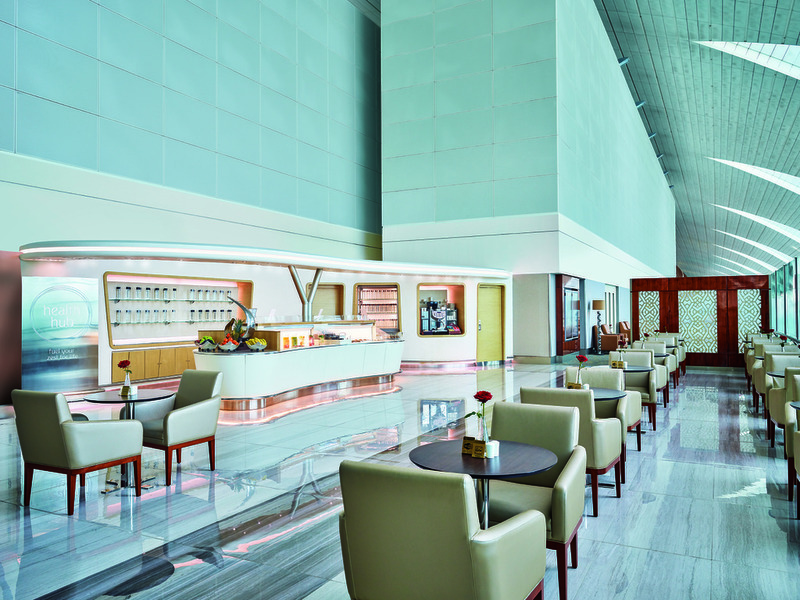 Emirates has the largest network of airport lounges worldwide. In addition to the seven in Dubai, there are 33 other dedicated Emirates Lounges in major airports across the globe. The airline has plans to extend pay-per-visit access to its outstation lounges in the future.